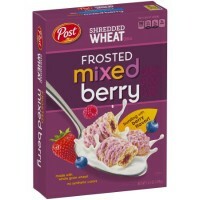 You can finally make yourself a morning person with Post Shredded Wheat Frosted Berry Cereal! 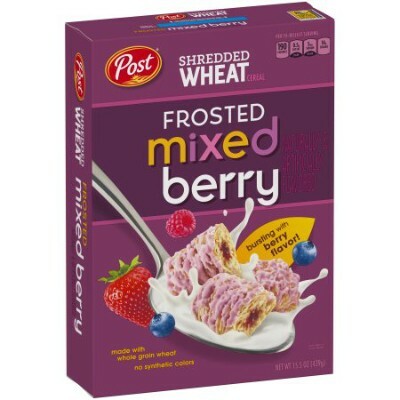 These morning treat features heart-healthy shredded wheat with a fruity berry frosting on the outside and berry filling in the inside! The fiber keeps you full while the fruitiness keeps you revitalized and ready to start your day! Whole grain wheat, sugar, dextrose, palm oil, corn flour, natural and artificial flavors, dried blueberries, gelatin, fruit and vegetable extracts (for color), acidity regulator E330, antioxidant E307 (vitamin E) to preserve freshness, reduced iron, vitamins B9-B3-B5-B1-B6. Contains GMO. Nutrition facts (for 100g): calories 350Kcal, total fat 2.5g (saturated fat 0.8g), total carbohydrate 81.7g (sugar 25g), protein 8.3g, salt 0g. la texture est particulière mais le gout est vraiment gourmand!